CogDog Desktop – Desktopize – Give you web applications desktop power! Mark Oehlert came by my email inbox asking for a snapshot of my desktop for his collection. I like to keep mine free of cluttered icons, and manage that the same way I clean up my office– just shove them into some other folder where you cannot see ’em. 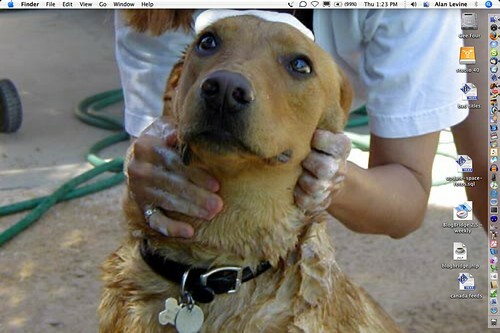 My desktop photos are set to rotate randomly form a folder in my Pictures directory, but I speficically fished out one of my favorites of Mickey, my now gone Lab (and blog model), getting a bath.